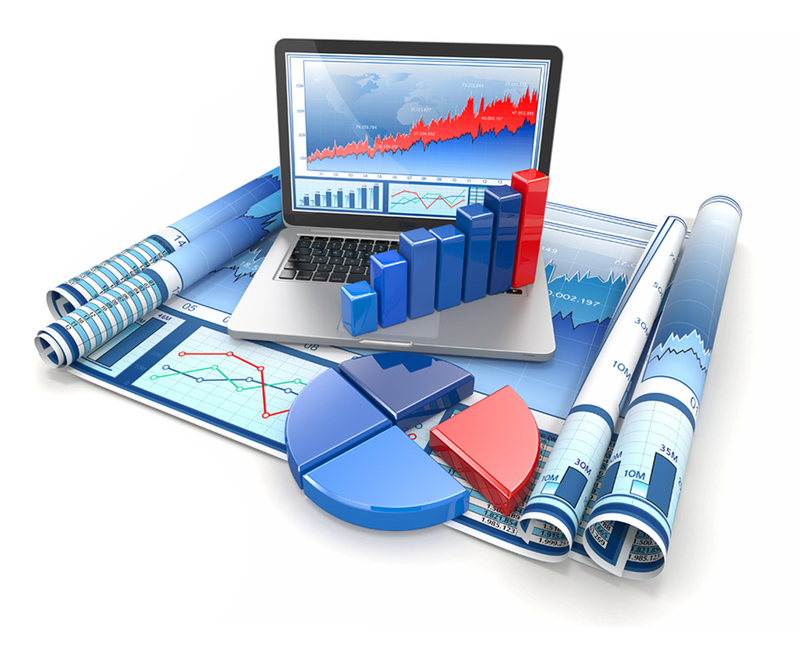 This year saw the introduction of the annual RSS Statistical Analytics Challenge, a new joint venture by the Young Statisticians Section and the Research Section of the Society. The 2014 Challenge was kindly sponsored by Select Statistics. For six weeks beginning in May, teams of intrepid analysts from across the globe battled it out in the “ultimate test of analytic skill, teamwork and creativity”. The Challenge brief sets out an open-ended research question relating to a large and complex data set. The goal of the Challenge is for each team to collaboratively explore and analyse the data – using any methods and tools that they wished – and submit a short report summarising their main findings. Nineteen teams from around the world registered for the 2014 RSS Challenge. Teams were encouraged to include a diverse range of members – male and female, career-young and career-not-so-young – and this diversity was clearly evident in the majority of teams. This year, the brief focused on the ‘Perils of Data Dredging’, and the Challenge was to produce the most innovative analysis of a set of neuroimaging data (specifically, resting state fMRI data), whilst “highlighting along the way the potential pitfalls for blind or naïve analysis”. No previous knowledge of brain imaging was needed to analyse the data, and teams were free to use as much or as little of the data as they liked (though a minimal data set was established). This freedom was embraced by all teams, and a wide variety of approaches were considered. The winners of the 2014 Challenge were announced on 4 August 2014. The Overall Winner was Team UCLStats (Beate Franke, Sam Livingstone, Alfredo Kalaitzis from University College London and Michael Betancourt from Warwick University) with their report entitled “Long-Range Spatiotemporal Dependence of fMRI Imaging Data”. Team SODA (Chris Brignell, Phillip Pane, Wilhelm Braun and Heather Pettitt) from the University of Nottingham was awarded “Highly Commended Runner-Up” with their report on the “Effect of smoothing halfwidth on estimated network structure in single-subject fMRI data”. Both teams were invited to present their findings at the YSS and RSS Statistical Analytics Challenge Session at the RSS 2014 conference in Sheffield on Wednesday 3 September 2014. Certificates were presented to both teams by Prof. Chris Jennison at the beginning of the session; this prize-giving was followed by excellent presentations from both teams and a lively discussion with the audience. With such a excellent response and exciting findings, we are very much looking forward to the RSS Statistical Analytics Challenge 2015 – so assemble your team, embrace the competitive spirit, and get ready to accept the Challenge! Our classic opening session, “The Young Statistician’s Guide to the Conference”, was more popular than ever, with Dr Jenny Freeman kindly taking the stage to furnish the audience with advice on how to get the most out of conference. Our Tuesday lunchtime mixer also attracted a record-breaking 60+ attendees, with a speed-dating icebreaker ensuring the mingling continued throughout the hour. On Tuesday evening, the traditional night of YSS revelry began with an unusually cerebral twist at the Bessemer pub, with more than 70 competitors eagerly battling it out for the inaugural YSS quiz crown, and an array of glittering (and not so glittering) prizes. After we were treated to some impromptu a-capella singing by a local men’s choir, the night swiftly took a cultural downturn, with a short bar crawl around central Sheffield finally culminating in a visit to eyeopening local nightclub “Pop World”. Wednesday’s YSS activities centred around two special sessions featuring presentations by the winners of the YSS/Significance Writing Competition, and the inaugural Statistical Analytics Challenge, a new contest set up collaboratively by the YSS and the RSS Research Section which will hopefully become a regular item on the YSS calendar. 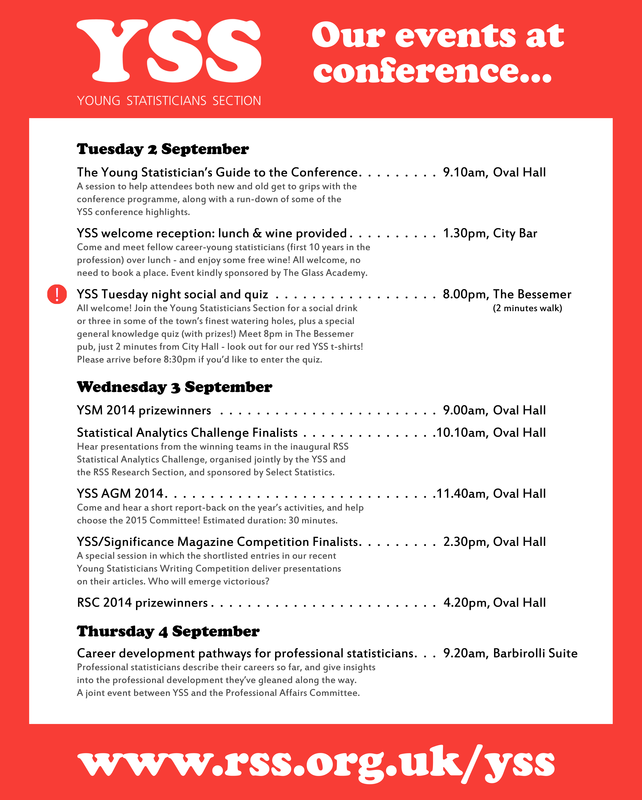 The day also featured sessions showcasing the prizewinning presentations delivered by young statisticians at the YSM 2014 and RSC 2014 conferences earlier in the year, and a snappy 30-minute AGM, during which Matt gave a brief review of the year, and the 2015 YSS committee were voted in. The day concluded with an excellent conference dinner, followed by another short trip around the watering holes of Sheffield. Finally, on Thursday, the YSS ran a joint session with the Professional Affairs Committee in which statisticians at different points along their career trajoectories spoke about the professional development opportunities they had encountered along the way. The session was well received, and may be a format worth revisiting at future conferences. All in all, the annual conference was once again an extremely successful three days for the YSS, with lots of positive ideas to build on for the future. Roll on RSS 2015 in Exeter!